Emergency Supplies are household goods that are set aside, so that they can be easily available in case of emergencies, such as: power outages; water contamination; natural disasters; and acts of terrorism. 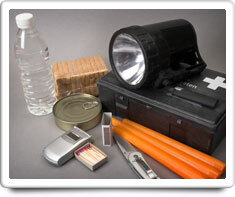 Typical emergency supplies include: jugs of fresh water, canned food, batteries, flashlights, candles, first aid kit, water purification tablets, manual can opener, matches, aspirin, IPECAC syrup, battery-operated radio etc. Shown in the 'Routine Care' section are the recommended routine maintenance tasks for your emergency supplies. The 'Q & A' section shows answers to common questions. And the 'Articles' section provides helpful articles about your emergency supplies. Because I really care about my clients! So far, no question have been submitted yet.